After the Office of Educational Assessment has provided you with a .csv document of your ScorePak®, it is possible to upload these scores directly to your Canvas Gradebook using the “Upload Scores” feature. The spreadsheet will already be formatted for use with Canvas and should not require any changes. Log into canvas.uw.edu and navigate to the course that you want to upload scores to. In the course navigation, click Grades. Note: To ensure that your spreadsheet has been formatted correctly, you can click What should the CSV file look like? 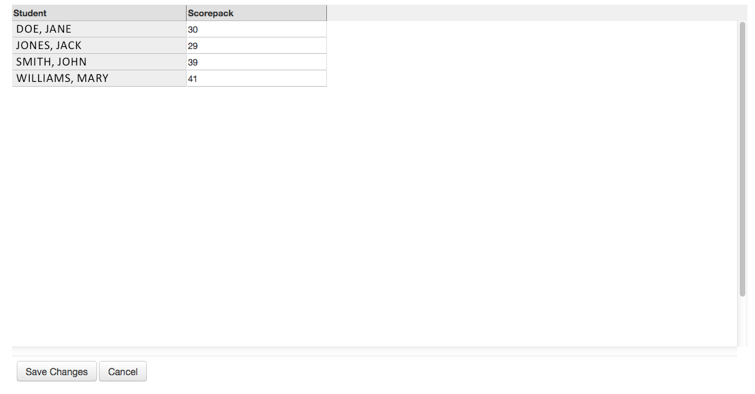 You can also click Download Scores prior to importing, and compare the format to your scorepack spreadsheet. Click browse and select the Excel file that contains your ScorePak® results (provided to you by OEA). You will be prompted to confirm whether your ScorePak® is a new assignment, or if the scores should be applied to an existing assignment. If you have already created an assignment shell in your Canvas GradeBook, select it from the drop down menu. If you have not created an assignment shell, select a new assignment, and confirm the number of Points Possible. Confirm the scores entered for this assignment, then click on Save Changes. You will then be redirected back to the Gradebook, where you can review your grades. If you wish to move the uploaded assignment scores to a specific assignment group, you may now do so through the Assignments tab of your Canvas course. It is also possible to copy and paste ScorePak® results into your downloaded Gradebook .csv, by creating a new column in the spreadsheet. Please note that there may be some discrepancies if you have a Test Student in the downloaded gradebook .csv, or if you also have columns for Current Points and Final Points. If you are prompted to confirm whether or not Current Points and Final Points are a new assignment, select Bogus, Ignore It from the menu. This will not affect your final grades in Canvas.